The 27.8 metre motor yacht Competitive Bid III has been sold with Jonathan Chapman in the Newport office of Northrop & Johnson acting for both buyer and seller. Built in GRP by Chinese yard Cheoy Lee to a design by Tom Fexas, Competitive Bid III was delivered in 1989 and fully refitted in 2009. Accommodation is for eight guests in four cabins consisting of a master suite, VIP suite, a starboard double and a port twin cabin, all with en suite bathroom facilities. In addition there is a fifth cabin that can be used either by guests or crew. The main saloon is full beam and furnished with cream coloured sofas and chairs along with a games table, entertainment centre and bar. Adjacent is a full service galley with marble countertops, a glass table and bench seating upholstered in white leather, making it an ideal spot for casual snacks. The aft deck caters to lovers of the outdoors, offering built in seating and a teak table with matching chairs, and a stairway leads up to the flybridge. The flybridge comes with more built in seating, three helm seats, a table with chairs, a bar, fridge, ice maker and comfortable sun loungers. 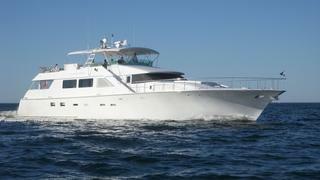 Twin Detroit Diesel 1271TA engines give her a cruising speed of 17 knots and a top speed of 21 knots. Her broker, Jonathan Chapman, comments: “Her previous owner has consistently upgraded her, doing something almost every year of his 11 year ownership." Competitive Bid III was asking $1,250,000.